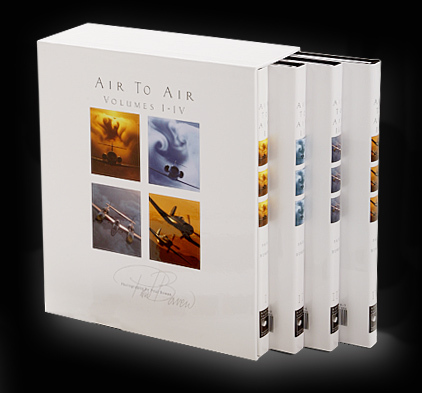 The books in the Air To Air series are an artistic collection of Paul Bowen's aerial assignments over the past 35 years. Often shooting from the open air tail-gunner's position of a WW II era B-25, Paul uses his camera to transform airplanes into flying sculptures. Each two-page spread includes aerial shots on location along with a group photo of the pilots and advertising personnel responsible for the behind-the-scenes production. Personal accounts from the photo shoots emphasize that the true heroes of the book, and any photo session, are the pilots. Bowen's first two volumes showcase general aviation airplanes, but Air To Air Warbirds features World War II vintage craft. Many rare planes were photographed in spectacular aerial sessions. A special chapter shows cockpits and close-up details of many planes shot in flight as well as the pilots. Air To Air Mustangs & Corsairs features arguably the two favorite World War II vintage craft.